I loved that cover and 'steampunk YA' had me on board. Ticker is a beautiful mix of emotion and invention that I would best summarize with the image of a clockwork heart skipping beats as family is threatened and love at first sight strikes! Mantchev's young adult steampunk novel takes the reader racing across a delightfully rendered landscape. Set in the city of Bazalgate, we go from cake factory to busy city streets, factory to family home and even up into an impressive airship. I loved the steampunk details - clockwork heart, augmentations, beetles and spiders, weaponry, transportation and the like. There's also some impressive fashion choices that had me longing, just for a moment, for the talent to make costumes. Really though, when would I ever find the time to exercise that skill? Far too many good books out there to read! What I'm trying to say is that Ticker has all the bits and bobs I like to see in a solid steampunk novel, including some novel inventions - possibly my favourite are the mundane bits of equipment at the sweets shop! The flavour of this book is spot on, and I loved that. I sank right into this world, enjoying every delightful detail that the book imparted. The story itself is go-go-go with constantly escalating threats and plenty of action, violence and tension to keep things interesting. I found the villain appropriately, and alternately, menacing and sympathetic. His heart is in the right place (hahaha) even if his methods are horrific. What I didn't buy completely was the romance between Penny and Marcus. This was a wee bit too 'insta-love' for me. I didn't mind all the butterflies (mechanical and hormonal) nor the instant attraction. What I bugged me was that they fell so easily into it. I wanted some kind of flailing, some resistance, some acknowledgement that forging a romance in the middle of all this chaos and danger isn't a recipe for anything lasting. There was something lovely about it once the book got going, but right off the bat? I wanted something a little less predictable - or at least more explanation, more struggle, more build to love. 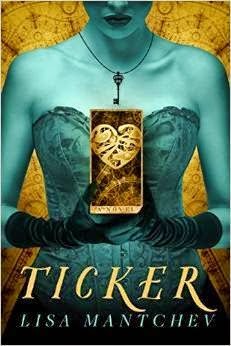 Ticker is a delightful steampunk novel for the YA reader. There's more cultural/social freedom in this setting than in the typical Victorian steampunk story, which is a nice twist. The fast-paced plot had me sailing through the pages, even when the romance made me roll my eyes (at least at first). I have seen this one around and actually am pre-approved for it on netgalley but I passed it by since I really need to stop requesting from Netgalley. I am now sad I did. I love steampunk books and this looks like one I might have enjoyed. Will have to see if it is still available. Awesome review!!! I'm so excited that you liked this and that it worked so well with the steam punk, even if the romance wasn't great. I grabbed this book with Kindle First so I'm looking forward to reading it even more now! Great Review!